Source: CICH graphic created using data adapted from McKeary, M., & Newbold, B. (2010). 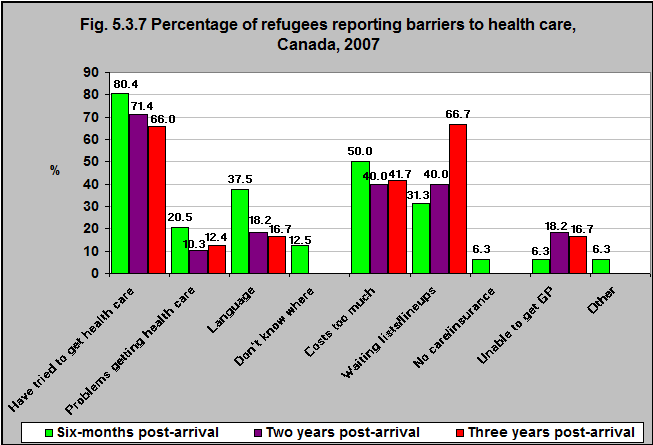 Barriers to care: The challenges for Canadian refugees and their health care providers. Journal of Refugee Studies, feq038. Based on 2007 data, more than one-fifth of Canadian refugees had problems getting health care within the first six months of their arrival. The most common barrier was cost: half of the refugees cited cost as a barrier and 38% said language was a barrier. Three years post arrival, two-thirds of Canadian refugees reported that waiting lists were a barrier and 42% reported cost as a barrier.